Hillbillies Video Slot Review - Casino Answers! Hillbillies is a 5-reel, 20-line video slot developed by Realtime Gaming, featuring three wild substitute symbols, scatter wins, multipliers, a free spins feature and a progressive jackpot. You can play the Hillbillies Real-Series Video Slot at Bovada. Bets on the Hillbillies slot machine are $0.01, $0.02, $0.03, $0.04, $0.05, $0.06, $0.07, $0.08, $0.10, $0.25, $0.50, $1, $2.50 and $5 per line. You can select up to 20 paylines. Hillbillies is a penny slot where you can bet up to the maximum total bet of $100 per spin. You can manually stop the reels using the skill stop feature. To play the Hillbillies slot game, select your bet and hit the “Spin” button. The Hillbillies video slot has a progressive jackpot, which is currently at $15,537.71 and growing very fast. The progressive jackpot is won at random, so you can win the jackpot on any spin. Progressive Jackpot wins are added to other wins. Random Jackpot contribution is no more than 1.5% of total Return to Player. You can play for the Hillbillies Progressive Jackpot at Bovada! The three Hillbilly symbols appear on reels 1, 3 and 5. They will multiply your winnings by 2X, 2X and 5X. The Hillbilly symbols can cumulatively multiply your winnings when appearing in winning combinations. 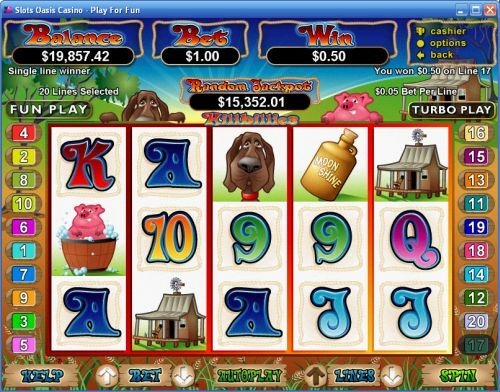 When all three symbols appear with two Hound Dog symbols, you can win the 5000 coin top fixed jackpot. When these symbols appear with other symbols they can pay out as follows: Pig (4000 coins), House (3000 coins), Moonshine (3000 coins), Ace & King (2500 coins), Queen & Jack (2000 coins), Ten and Nine (2000 coins). The Hillbilly symbols are scatter symbols in addition to being wild symbols. You can get a scatter payout by hitting two of these symbols at the same time. You can win up to 10X your total bet by hitting all three symbols – plus lots of wild multiplier wins! When two or more Hillbilly symbols appear anywhere on the screen, you will win 8 free spins at a 2X multiplier. All prizes during the free spins feature except for Hillbilly Bonus wins are doubled. The free spins feature can be re-triggered. Free spins are played at the lines and bet of the triggering game. During the free spins feature, Hillbillies appear on reels 1, 3 and 5 and award a bonus prize of 2X, 2X or 5X respectively. The prize is multiplied by the triggering bet and is added to payline and scatter wins. The Hillbillies slot machine has an advanced autoplay mode. Hit the “Autoplay” button to open the autoplay settings. You will be able to set the number of spins, set it to stop when the jackpot is won, stop if a win exceeds or equals (any amount you input), stop on any win, stop if your balance increases/decreases by any amount you input and stop once the feature is triggered. You can stop the Hillbillies autoplay mode using the “Stop Auto” button to deactivate it. 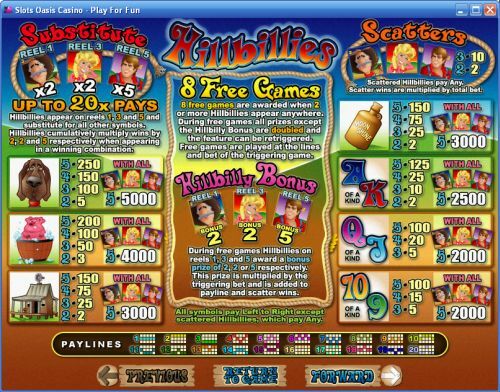 Hillbillies has a lot of interesting special features, including wild multipliers. There is also a good progressive jackpot that you can win on any spin you make. You can play the Hillbillies video slot when you sign up and make a deposit at Bovada. Where can players from the United States of America play the Hillbillies online slot? Players from the USA can play the Hillbillies casino game at USA-friendly RTG online casinos such as Bovada.